Beginning last fall, many clients started asking me about how the economy was affecting fundraising auctions. South Florida Urban Ministries was one of them. The economy was our first topic during our coaching session in January. In the course of conversation, I talked about how a dip in the economy actually spurs some companies to new heights. I cited an example. 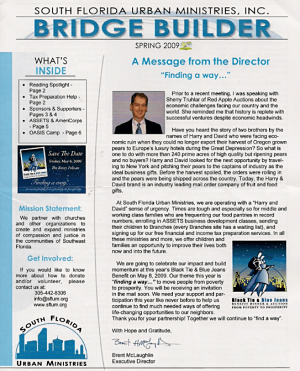 A few weeks later, the Executive Director used that example in his quarterly letter to donors. Although it was a jolt to see my name in the first sentence on the cover of the newsletter, I was excited to see that SFLUM was directly addressing the issue with its supporters. The Executive Director reminded supporters about the good work SFLUM was doing in the community, he talked about some immediate needs, and he set the tone that it’s time for everyone to band together to help each other. Kudos! Are you wondering what to do in these times? Or that company I mentioned? With SFLUM, I talked about how many millionaires have been made in down economies. Our current recession is a natural cycle. Some businesses will fade away for failing to remain competitive (unless the government provides bailout money), and others will thrive. I’d suggest this is a wonderful time for many people to birth their own businesses. Sometimes all we need is a kick in the pants (like a job layoff) to make us take the initiative to make a change we’ve been wanting to make for a long time. I told the story of a company which leaped to the top during the Great Depression. Harry and David, the mail-order company which makes those yummy gourmet gift baskets, was facing economic ruin when they could no longer export their Oregon-grown pears to Europe’s affluent market. In dire straits, they began to think creatively. They realized they could start shipping their product by that newfangled service called mail. In 1934, the brothers traveled to San Francisco and New York to pitch their product to industry leaders. They pitched to those businessmen that their luscious pears would make the perfect business gift. Their idea worked! Orders flooded the store, the pears found a new fan base all over the United States, and Harry and David became a direct marketer of fruit and food gifts. The mail-order catalog industry was born. Just as Harry and David sought out new customers, you might need to seek new donors. The traditional places you’ve farmed for donations and sponsorships might be less able to give. Seek fertile ground elsewhere. There is still money being made and there is still money being spent, but you might have to seek it in a different corner of your world. Throw a wider net. Reach out to more potential donors to ensure you procure enough of the right items. Reach out to more people (call them to personally invite them) to keep your audience numbers up. Be creative in thinking about what types of items you want to sell. Items which cannot be purchased elsewhere (e.g. lunch with a well-liked mayor; a day with the fireman, etc.) will always draw bidders, regardless of the economy. Stay mission focused. It’s important to remind your supporters about what you do. Subscribe to Entrepreneur or INC magazine (one of my favorites) and see which companies are growing. Target them. Maintain your upbeat, positive outlook. Enthusiasm sells! You’ll attract more donations for your benefit auction when you personally are convinced that a donor should give.